Friday, 20 January 2017 By Marchetto Pellami S.p.A.
Certain things must be celebrated. A successful fundraising campaign which has seen many entrepreneurs from the Vicenza tannery district, headed by the Dani tannery and the “Amici del cuore” ONLUS, mobilize in favor of the Hospital of Arzignano to purchase an innovative medical device, has every reason to be a big party. 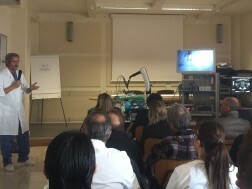 Today, 20 of January, the innovative ultrasound and the robotic arm system for laparoscopic procedures has been inaugurated at the urology department of the Hospital of Arzignano. An important medical tool for the region but also for the country (as it is rather rare in Italy), that has been explained by the Director of the urology department Alessandro Ruffato. It is an evidence of a solidarity race which has seen our company together with other entrepreneurs get involved in a moment when we have to stay united. The campaign started last Christmas 2015, was followed by a year of effort that ended successfully with the collection of the amount needed.